According to Dr. Lozito, if the goal is to translate regeneration research to non-regenerating species like humans, the lizard is a much better model than the salamander. Lizards are the closest relative to mammals that can regenerate an appendage, and they have a similar genome and biochemistry. 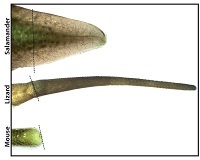 But lizards cannot regenerate lost limbs at all, and their regenerated tails are much simpler than the originals. Dr. Lozito’s lizard of choice is the mourning gecko, which has several interesting properties, including a high tolerance for transplantation. But perhaps the most surprising observation, according to Dr. Sun, is that the traditionally described “neural stem cells” driving regeneration in the lizard are not “true” neural stem cells at all. Although they check many of the classic boxes, they fall short of a defining characteristic – the ability to spring forth a diversity of cell types.